Companions, character arcs and The Ribos Operation (1978) | Randomwhoness: a Doctor Who blog by Johnny Spandrell. Sampling stories in random order. That Robert Holmes was an old slyboots, as the fourth Doctor might say. In the opening scenes of The Ribos Operation, he can’t resist having a jab at his leading man, the by-this-time-in-his-tenure increasingly temperamental Tom Baker. Holmes has the ethereal White Guardian (well, I say ethereal. He’s an old safari-suited gent in a wicker chair sipping an verdant looking liqueur) assign the Doctor a new assistant to, well, assist on his quest for the segments of the Key to Time. The Doctor hates the idea. ‘In my experience,’ he pleads ‘assistants mean trouble. I have to protect them and show them and teach them and couldn’t I just manage with K9?’ But the man in the big chair insists. He clearly knows K9 can’t even get himself out of those Police Box doors without the camera cutting away, quite apart from the fact that more glamorous help is going to be needed to keep those Dads watching. So a new female sidekick is delivered. Tom… I mean the Doctor, shoots the White Guardian a mutinous look. I can imagine Holmes watching this episode go out and chuckling into that pipe of his. During his stint as script editor, I bet he would have frequently heard Tom’s opinion that he didn’t need an assistant. Indeed he wrote the story designed to prove Tom wrong. But here he indulges in some self-referential commentary; the powers that be have deigned that Tom/the Doctor gets a new companion, whether he likes it or not. The new assistant is Romana, played with ice cold snootiness by Mary Tamm. 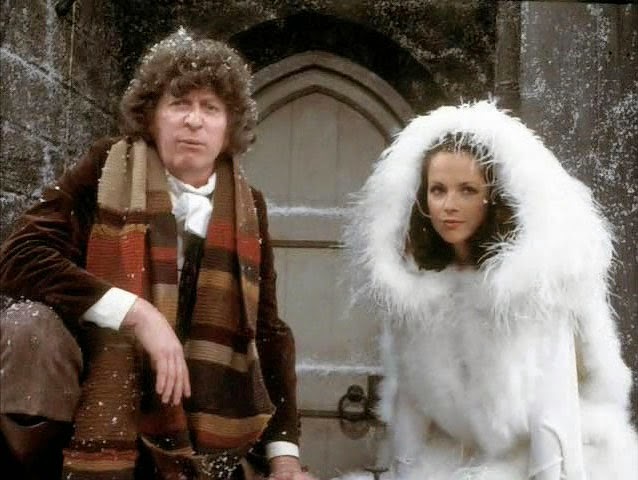 Romana is an apprentice Time Lord, designed to be a better intellectual match for the Doctor than companions past. This she is, but being a know-it-all also gives her the ability to comically undermine the Doctor by sometimes being more competent than him; she can fly the TARDIS better than him, not walk into animal traps and scored higher than him in the HSC. It seems familiar to us now, because Romana’s direct descendant is River Song; both women point out the Doctor’s pomposity and silliness by outDoctoring him. But this is the first time in the series we see a companion with the ability to do this consistently. Of course, she’s not allowed to be too clever. She turns out to be smart but inexperienced. So the Doctor still has plenty of opportunities to do all the clever things and point out to Romana that she’s wrong. In some ways this is even more sexist than Doctor Who normally is; to introduce a strong, funny and appealing character and then undermine and patronise her frequently. Some have said this is demonstrated when Romana’s very first episode ends with her screaming at a monster (it doesn’t, by the way). I think it’s more clearly symbolised by a moment in Part Four, when she ends up pushing vainly against a polystyrene rock. Doesn’t matter how bright you are, Doctor Who‘s basic template reasserts itself. You’re the assistant. The Doctor’s the clever one, you’re the asking questions, pushing jablite one. Now put on this ridiculously inadequate costume and let’s go. That’s unless you’re able to throw away the template. And I think the next story, Douglas Adams’ The Pirate Planet is a case in point. Romana is a much more active figure in that story. She can land the TARDIS properly, she deduces and solves as much as the Doctor… It short she’s allowed to be the character she was designed to be. Perhaps what we can see in these two stories is the different approach of two brilliant writers. Holmes, a veteran, committed to the old ways. Adams, a young Turk, ready to tear them all up. But enough of that, it’s time to invoke a fan cliche and consider the ‘Holmesian double act’, which is overused shorthand for Holmes’s tendency to pair characters together within his stories. On first sight there are two in The Ribos Operation, exiled soldiers the Graff Vynda-K and Sholakh and galactic con men Garron and Unstoffe. Both are superior/subordinate pairings which is another pattern Holmes uses regularly. But the more interesting pairing is one no one seems to mention, that of Unstoffe (Nigel Plaskitt) and Binro (Timothy Bateson). To step back a bit… The Ribos Operation is sometimes summarised as the story of Garron trying to fool the Graff into buying a planet based on a lie that it contains great mineral wealth. But that plot ends halfway through Part Two, when the Graff discovers Garron has bugged his room and the game is up. From then on, The Ribos Operation becomes a simple man hunt; Unstoffe has the Graff’s money and a lump of space crystal called jethryk and the chase is on. Unstoffe is assisted by a homeless man known as Binro the Heretic. Binro is a stand in for Galileo; both believe, in opposition to the prevailing view, that their planets circle their suns. Both are persecuted for adhering to these ideas and both are forced to recant. There’s quite a nasty instance of suggested violence in The Ribos Operation when Binro retells his story. BINRO: They said that if I did not publicly recant my belief, the gods would destroy our world. BINRO: In the end. See these hands? (He raises his gnarled, twisted hands) Useless for work now. That’s why I live here. That’s brilliant writing. In just a few short sentences, we know the whole story. Torture, specifically breaking of Binro’s hands, the tools needed for writing and conveying ideas. Without his hands, he couldn’t work. Without work, he was forced onto the streets. Doctor Who may well have adopted a lighter tone when Graham Williams took over as producer, but the darkness is always there, just a little better hidden than before. Binro helps Unstoffe conceal himself because, as he says, ‘I know what it’s like when every man’s hand is against you.’ In return, Unstoffe confirms what Binro believes about planets and their movement. So grateful is Binro that he becomes Unstoffe’s guide through the catacombs in an effort to outwit the Graff. It fails in the end, and Binro gives his life for Unstoffe, killed by the Graff and his men. And although this prompts Unstoffe to make a headstrong rush at the guards, he is otherwise untouched by Binro’s intervention in his life. The pay off is as clear as it is absent. Binro’s friendship should have meant that Unstoffe changed his thieving ways. Certainly he shouldn’t stick around with Garron, as he does at story’s end. Perhaps he should have stayed on Ribos, to take up Binro’s ideas and convince people of them. His character’s journey would be complete. Or perhaps he should have left with the Doctor, and join the quest for the Key to Time. How about that? The Doctor, Romana, K9 and a light fingered, artful dodger type. Nah, that’d never work. Besides, we know how Tom feels about assistants. LINK to The Masque of Mandragora: Catacombs! Three stories in a row. NEXT TIME: Just you watch your lip or I’ll put you across my knee and larrup you. Then I’ll make you watch/listen to The Wheel in Space.